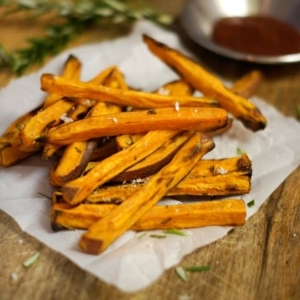 Baked sweet potato fries are elevated to a new level with the addition of fresh rosemary! Drain and rinse well, to ensure the starch is removed, then pat dry with a towel, so that the resulting fries are nice and dry. Transfer the fries to a clean bowl, and toss with the coconut oil and rosemary, using your hands or a spoon to coat evenly. Arrange the fries into a single layer on the lined baking sheet, and bake at 425F for 15 minutes. After the 15 minutes, remove from the oven, flip them over using your fingers or a fork, then return to the oven for another 10 minutes, or until the fries are golden around the edges. Sprinkle immediately with a generous portion of sea salt and pepper, while the fries are still hot and glossy. Serve immediately, with your favorite dip, if you like!